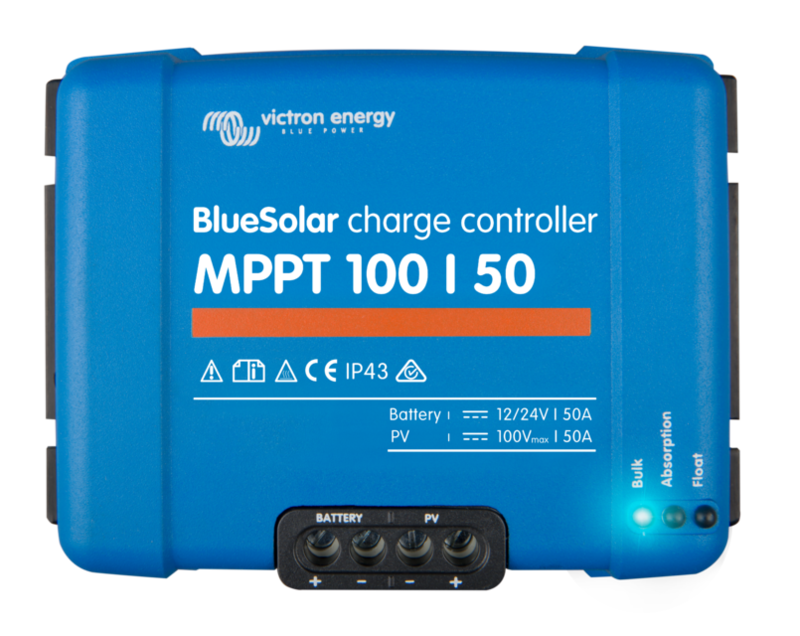 Victron's BlueSolar 100/50 MPPT charge controller will optimise the charging current from larger solar arrays up to 1400W (700W at 12V). The latest MPPT algorithms developed by Victron allow adjustments to be made much more quickly. Rapidly adapting to changing conditions means that the Victron MPPT 100/50 can produce up to 10% more than standard MPPT controllers. One of the biggest problems in off-grid solar installations is partial shading. When this happens, there might be more than one maximum power point for the shaded array. Standard MPPT controllers tend to use only one power point, but the Victron MPPT algorithm is able to shift the power point according to the conditions. Partial shading of the solar panels will never be completely eliminated, but Victron MPPT controllers make the best of a bad situation. To improve reliability, the Victron MPPT 100/50 is fitted with advanced 'fan-less' cooling and housed in a robust case. For optimum charging, there are also 8 different charge settings to choose from, depending on your battery type.